Running a restaurant or even working at one can be a hectic experience. One of the most important aspects of keeping an efficient establishment is allowing people to make reservations for meals at certain times. Some people have a complicated schedule and can only manage to eat during certain predetermined times and as a restaurant owner, you’re expected to be able to handle and organize this situation effectively. Don’t fret! My Excel Templates offers a free Restaurant Reservations template that helps to schedule hourly reservations with many options available. You’ll see that the reservations template has two worksheets: Availability and Reservations List. Learn how to use the template below. Open the template to the Restaurant Reservation sheet. Note that customer information is entered here and corresponds to the second sheet in the template. You’ll notice in the Availability tab, reserved times as well as table information can be seen. Customize each table type on this sheet. Change the “Reference Start Time” at the top of this sheet to change what times are shown in the availability table. It’s so simple to store in-depth information about each table in your restaurant in the template. Here are a few tips to get things moving. Information entered in the Reservation sheet will update the time table on the Availability sheet. Note the legend with the explanation of color usage on the right hand side of the Availability table. Enter notes about each table in the Table Type area of the Availability sheet. The most popular types include information about the area of the restaurant needed and if smoking is permitted in that section. There are sections for you to enter table capacity and the table number to make things easier for the waiter or waitress. 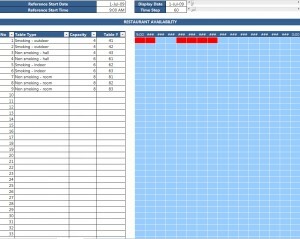 Make your work day easier and track customer reservations with the Restaurant Reservations Template. Save yourself the hassle and get a free copy of it today!